Designed for miking the acoustic cello without permanently installing a transducer. 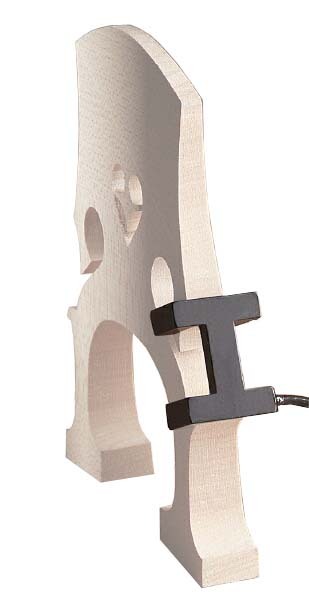 Clamps easily to cello bridge and removes easily - no drilling or tools needed. This transducer is a favorite for its ability to capture the full musical range of the cello - delicate tones to deep lows. Includes the 3000A preamp. The included clamp-style pickup can be easily attached to or removed from any standard-type bridge. No drilling or tools needed. The pickup is equally responsive to delicate high tones and deep lows, and delivers the full musical range of your cello. 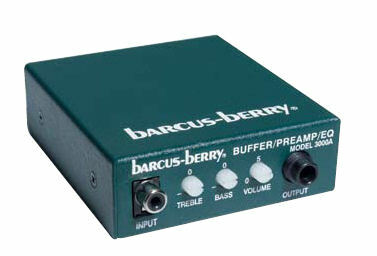 The Barcus-Berry 3000A is specifically designed to work with all Barcus-Berry piezo pickup systems. The 3000A features external bass, treble and volume controls to allow a wide range of adjustment. Includes a belt clip for unrestricted movement. Battery operated, does not provide or run on phantom power.